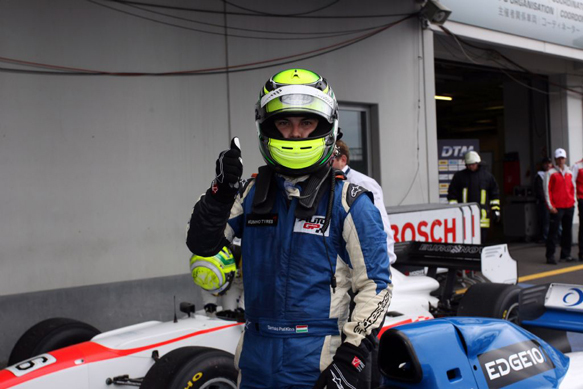 Hungarian Tamas Pal Kiss took Auto GP victory for Virtuosi UK at the Nurburgring, with Kimiya Sato scoring a fine second place after starting at the back of the grid. It was Kiss's good behaviour that really set up this win, which allowed him to slightly close the points gap to his Euronova Racing rival Sato. Most of the field were given drive-through penalties for setting fastest sector times as they went past the clean-up operation of Salvatore de Plano's car, which went off the track at the final corner on the opening lap. Kiss was the only frontrunner to escape sanction, which set up his comfortable 10-second win. On pace alone Sato could not be matched, despite driving with some pain after a bruising in his qualifying accident on Friday, and looked set to score a remarkable win before the penalties were announced. Sato ran a different strategy to the other frontrunners: hitting the front when the others stopped, keeping his lead after taking his drive-through along with the rest, and then leaving his pitstop until the 26th and penultimate lap. Sato built up his lead over Kiss to 22 seconds ahead of that late stop, which simply wasn't enough of a cushion to come out ahead of Kiss, who was among the first to complete his pitstop on lap seven. Second place went to Sato, well clear of Kevin Giovesi, who was the early race leader after an excellent start took him past poleman Markus Pommer. Giovesi's drive-through spoiled his afternoon, as it did that of home favourite Pommer, who came home fourth.